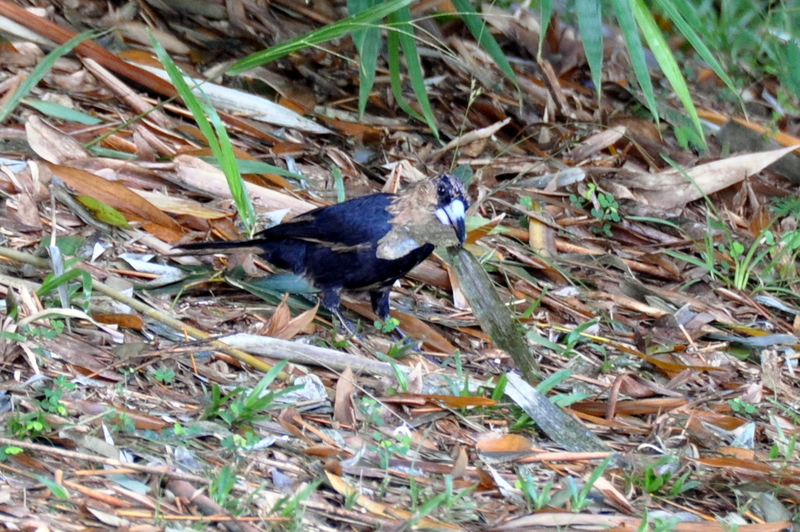 Returning from a stroll around the ponds I saw movement on the ground under the bamboos; although obviously a Black Butcherbird (Cracticus quoyi) I thought, at first, that it must have a bamboo leaf stuck on its face. However, it was just beautifully camouflaged amongst the fallen leaves, which it was picking up and throwing aside while looking for insects, worms, or whatever unsuspecting creature might be hiding under this damp carpet. 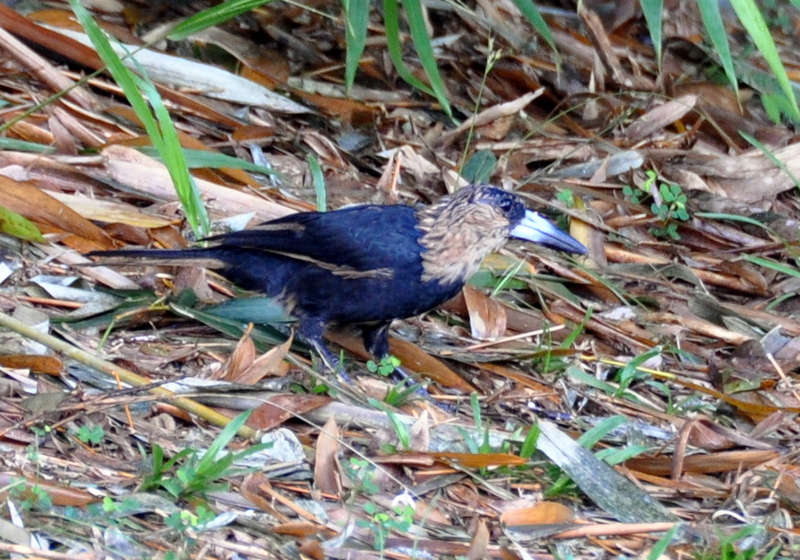 As several pair of Black Butcherbird have successfully raised young in the last few months and the juvenile birds were a rufous morph, we presume that this one is in an eclipse phase. And in spite of the Black Butcherbird’s voracious appetite there are still large numbers of reptiles, small birds, frogs and insects living here so the property seems quite able to support them. And now for something completely different – a Striped Swampdragon (Agrionoptera longitudinalis biserialis) which likes shady pools and tree holes and rather obligingly perched on this broken stem while hunting for and catching mosquitoes. Its a medium sized Dragonfly but looks quite impressive when you look closely. 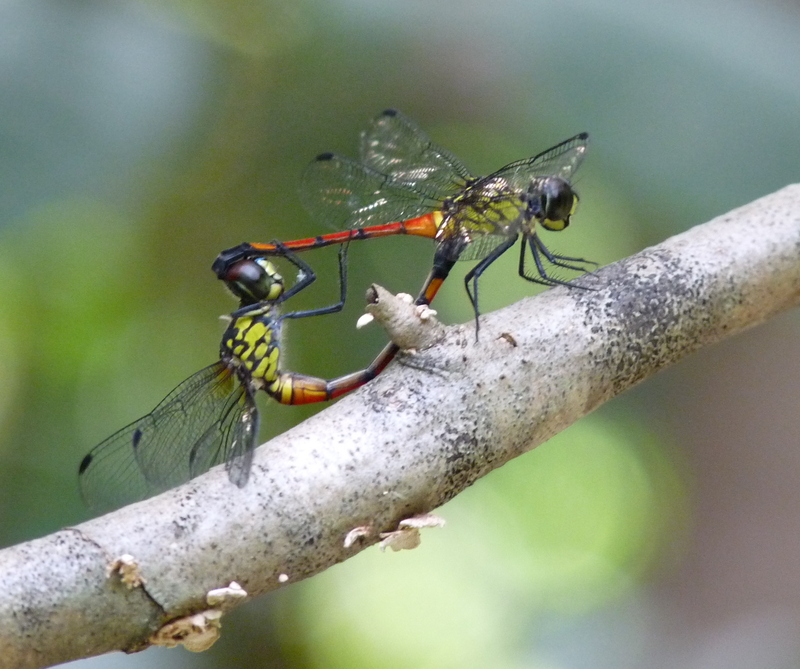 Closely related to the above is this pair of Red Swampdragon (Agrionoptera insignis allogenes), which also inhabit shaded ponds and swamps as well as streams. The Red Swampdragon seems to be more common here and also has a habit of perching which makes photographic capture relatively easy, although I think the pair below were distracted enough not to be concerned with a prying lens. 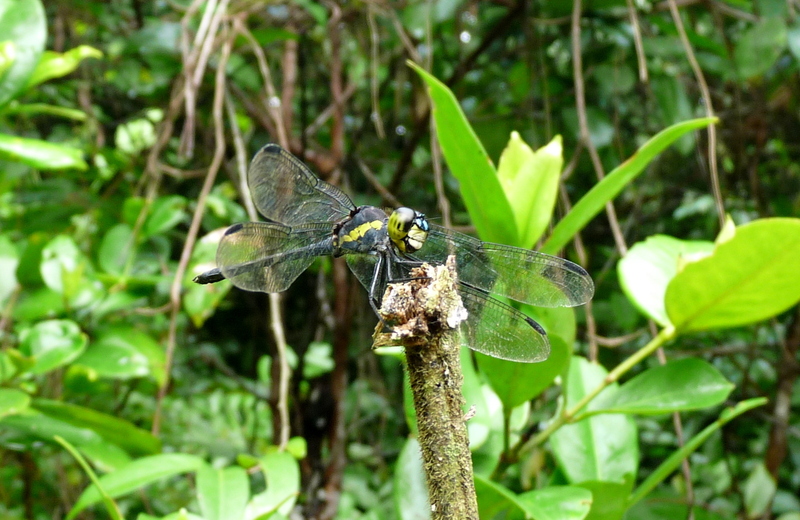 This entry was posted in Bird Observations, Dragonflies, Insect Life and tagged Black Butcherbird, Red Swampdragon, Striped Swampdragon. Bookmark the permalink. 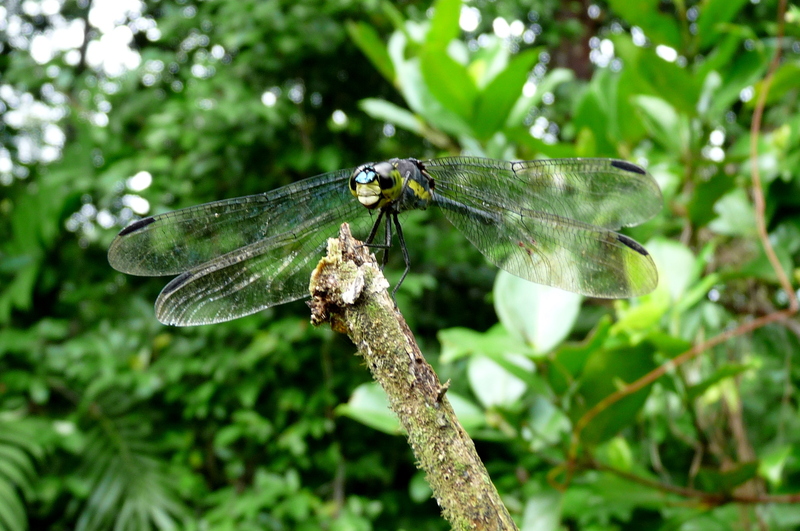 Lovely images of beautiful Dragonflies, Barbara.